An attempt to go nuclear? The Minister of Hydrocarbons, Luis Sánchez, delivered this morning 50% of his responsibilities, until yesterday, to the new Energy Ministry, which will be at the head of the new authority, Rafael Alarcón. 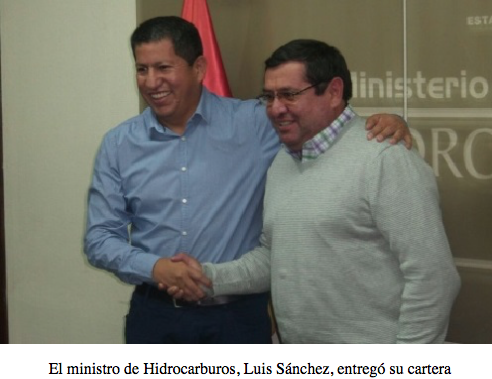 “We will be a single team to consolidate that Bolivia is the energy heart of Bolivia,” said Sánchez, during the delivery of the office of what was the vice-minister of Electricity and Alternative Energies. “We will boost energy production for the export of surplus energy and generate resources for the country,” said Minister Alarcón. I believe that the coca grower caudillo’s most important task is to remain in power, at all cost … Money is gone, over $180 billion dollars were wasted by this ruling ochlocracy and little if anything has been done to promote investment and to find more gas/oil fields. Like the ruler in Venezuela, this ochlocrat needs money to pay “bonuses” to secure “loyalty”, so he intends to pursue after nuclear energy, while countries like Germany have abandoned that source of energy. This entry was posted in Bolivia, Business, Economics, Energy, Environment, Politics, Social Unrest and tagged bad politics, demagogue, government failures. Bookmark the permalink.